Handmade from 16-gauge stainless steel, this single bowl sink will take care of your bar area or kitchen needs. Exterior Dimensions 19" x 20" x 10". Interior Dimensions 17" x 18" x 10". Featuring zero radius corners, this single well sink will add a modern touch to your current kitchen. Exterior Dimensions 23" x 18" x 10". Interior Dimensions 21" x 16" x 10". Made of solid 16 gauge stainless steel, this single bowl kitchen sink is large enough for all of your food preparation and cleaning needs. Exterior Dimensions 36" x 19" x 10". Interior Dimensions 34" x 17" x 10". 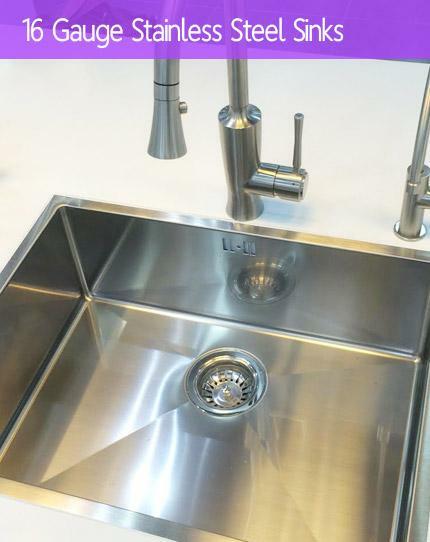 This full sized bar style prep sink is made of 16-gauge stainless steel and features contemporary zero radius corners. Exterior Dimensions 42" x 8-1/2". Interior Dimensions 40" x 6-1/2". Depth 6". Zero Radius Design. This single bowl sink is perfect for your outdoor bar or use it as a prep sink in the kitchen. Exterior Dimensions 17" x 15" x 9". Interior Dimensions 15" x 13" x 9". 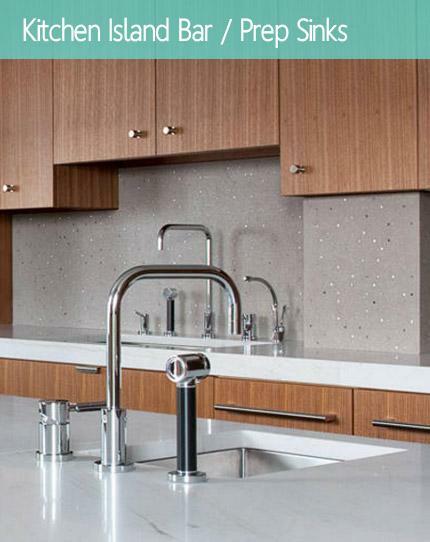 Add a modern touch to your kitchen, laundry room, or bar area with the Ariel zero radius design kitchen sink. Made from high quality 16 gauge stainless steel. Exterior Dimensions 26" x 20" x 10". Interior Dimensions 24" x 18" x 10". With a side drain board that can be used on either the left or right, this double bowl sink is ideal for large cooking projects. Exterior Dimensions 42" x 19" x 10" | 7". Drain Board 13"
Multitask with ease with this triple bowl undermount sink. Handcrafted from 16-gauge stainless steel. Dimensions 42" x 20" x 10" I 6" I 10". Add this heavy duty double bowl sink to your full sized kitchen. Made from highly durable 16 gauge stainless steel. Exterior Dimensions 42" x 19" x 10". 26 Inch 15mm Radius Design Kitchen Sink and Lead Free Faucet Combo. 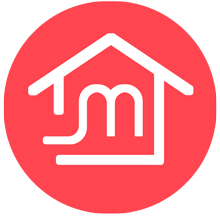 Package Includes Single Bowl Kitchen Sink, Matching Protective Bottom Grid and Silicone Dish Rack (Color will vary on availability), Deluxe Lift-out Basket Strainer & a Eclipse Design Stainless Steel Kitchen Faucet. This full sized undermount single bowl kitchen sink combo is the perfect addition to your dream kitchen. Exterior Dimensions 36" x 19" x 10". Interior Dimensions 34" x 17" x 10". The Ariel Pearl 14 Inch Stainless Steel Undermount Single Bowl Kitchen / Bar / Prep Sink is the perfect sink your bar prep, outdoor BBQ, or kitchen area. 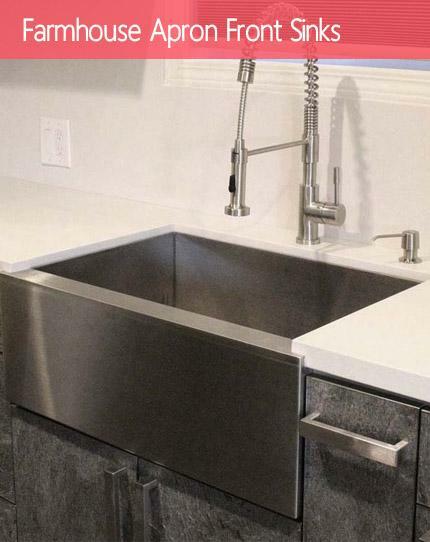 Made from heavy duty 18 gauge stainless steel and featuring a gorgeous pearl satin finish, the Ariel Pearl 14 Inch Stainless Steel Undermount Kitchen Sink will be the focal point of your new modern day kitchen, bar, or prep area. Overall Dimensions: 14-1/2" x 13" x 7". 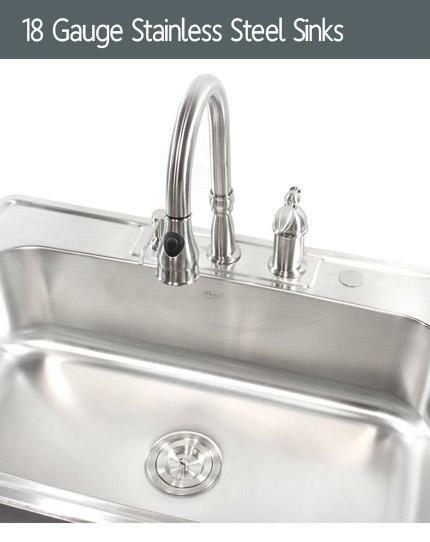 Made from solid 16 gauge stainless steel, this undermount sink will resist stains, rust, and corrosion. Exterior Dimensions 16" x 20". Interior Dimensions 14" x 18". Depth 10". The classic 26 inch single bowl sink is perfect for all your kitchen needs. Great for any bar area or prep station. Exterior Dimensions: 26" x 20" x 10-1/2". Interior Dimensions: 24" x 18" x 10-1/2". 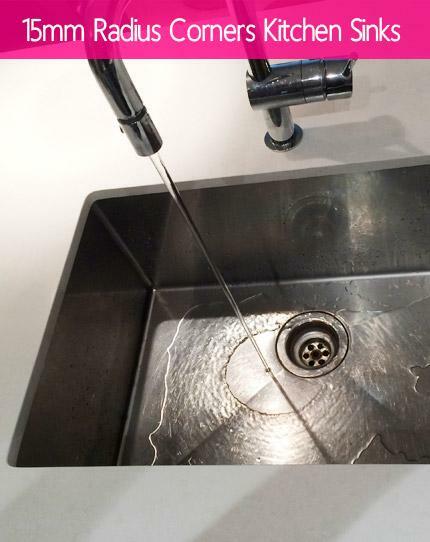 The enormous 50/50 double wells of this undermount kitchen sink makes kitchen tasks a breeze. Crafted from heavy duty 16 gauge stainless steel. Dimensions 37" x 20" x 10". This single bowl sink is constructed of high quality 16-gauge stainless steel and is the perfect size for a small space. Exterior Dimensions 15" x 20". Interior Dimensions 13" x 18". Depth 10". 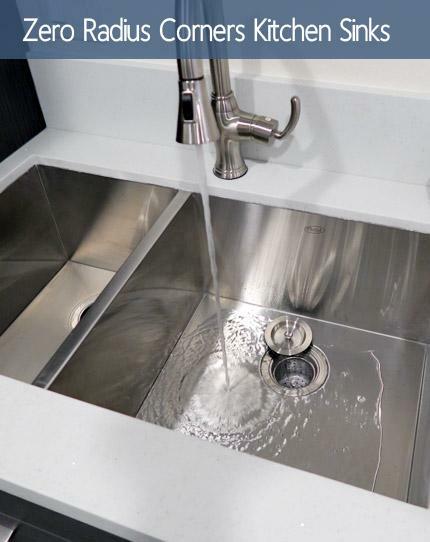 Aesthetically pleasing to the eye, this 50/50 sink is ideal for both food preparation and cleanup. Hand crafted from 16-gauge stainless steel. Exterior Dimensions 37" x 20" x 10". Interior Dimensions 35" x 18" x 10". . 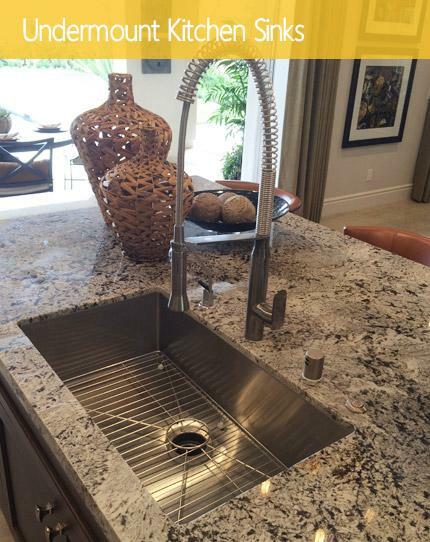 This spacious sink features deep 50/50 bowls and is constructed from 16 gauge stainless steel. 50/50 dual compartments make it easy to wash and rinse dishes. Exterior Dimensions: 29" x 20" x 10". Interior Dimensions: 27" x 18" x 10". 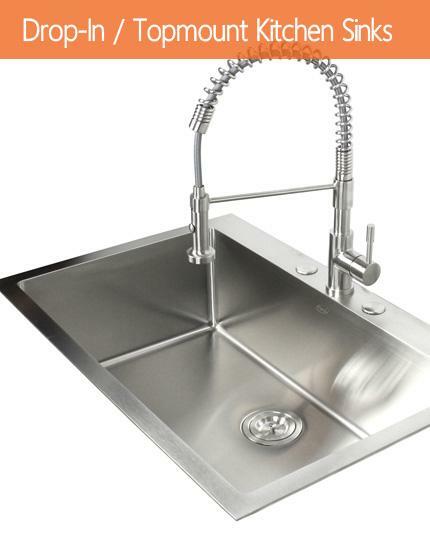 This bar style prep sink is made of 16 gauge stainless steel and features contemporary zero radius corners. Perfect for smal bar area or kitchen islands. Exterior Dimensions 23" x 8-1/2". Interior Dimensions 21" x 6-1/2". Depth 6". With a side drain board that can be used on either the left or right, this single bowl sink helps water drain away from dishes. Exterior Dimensions 36" x 19" x 10". Interior Dimensions 21" x 17" x 10". Drain Board 13"
Undermount Kitchen Sink. 16 Gauge Stainless Steel. Single Bowl. 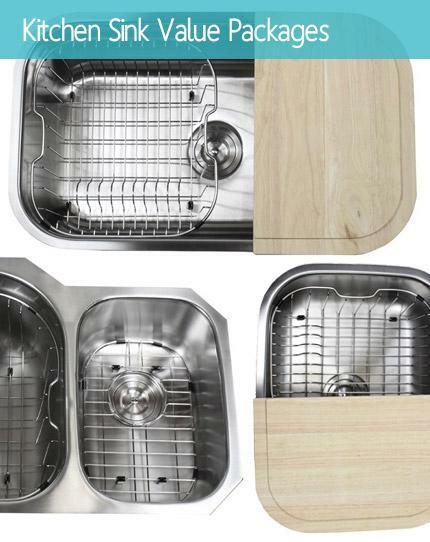 Sink comes with Matching Protective Grid, Deluxe Basket Strainer! Exterior Diameter 17-1/8". Interior Diameter 16". Depth 7". Perfect for a small kitchen, bar area, or outdoor barbeque, this single bowl undermount sink is made of 16-gauge stainless steel. Exterior Dimensions 17" x 15". Interior Dimensions 15" x 13". Depth 9". Upgrade your standard kitchen sink to the Ariel 23 inch. Perfect for the bar area, small kitchen, or laundry room. Exterior Dimensions 23" x 18" x 10". Interior Dimensions 21" x 16" x 10".